In 2003 the Evolution 38 was introduced onto the market and after just a few years the Evolution 38 has proved itself to be a good, solid and safe working platform withstanding all conditions the English weather can throw at it. Most of the Evolution 38's built have a commercial use, angling & dive charter with a top speed of around 27 knots and a cruising speed of around 18 knots. (Depending on engine) The Evolution 38 has a deep 'V' tri-hedral hull design & a 45° bow for a smoother ride that handles exceptionally well in all weathers. A Nidaplast deck & wheelhouse bulkhead can be used instead of ¾" marine ply to make the boat lighter and even more economical. Full-length keel with skeg and rudder protecting prop. Prop tunnel for shaft angle reduction. There is a toilet on-deck and flush engine hatch or engine box option available too. A shortened wheelhouse version can be made giving even more deck space if required. 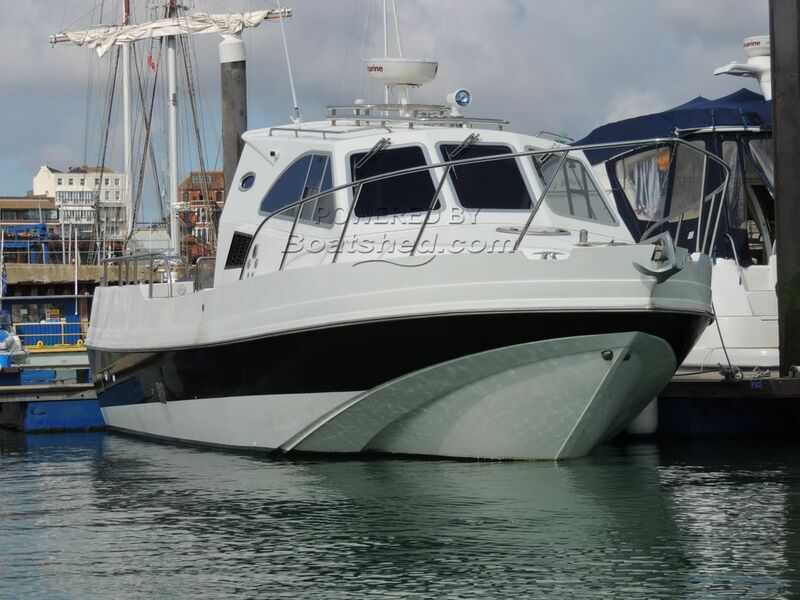 The perfect boat either for Family leisure or Commercial Charters. She is finished to an extremely high specification. This Evolution 38i has been personally photographed and viewed by Jamie Nash of Boatshed Kent. Click here for contact details.